Images on the right in this page are from a 2010 trip into Kazakhstan, by Ross Ahmed. It remains to be seen if the birds breeding near Aqtobe and Qostanay in Kazakhstan should be called 'barabensis', as they still show several features reminiscent of cachinnans. They may also just represent birds from the transition zone. A. R. Dean went to Kazakhstan in 1987 and 2008 and reports: This form breeds primarily in steppe lakes from south-west Siberia, from the Urals to the Omsk region, but is also assigned by some authors to the gulls breeding in northern Kazakhstan. In 2000, a study of the gulls at the Chany Lakes, in southwest Siberia, was published by Panov and Monzikov ('Status of the form barabensis within the ‘Larus argentatus-cachinnans-fuscus complex’'. British Birds 93: 227-241). 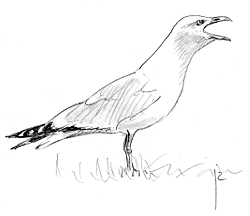 Their study recognised barabensis as distinct from cachinnans but also stated that birds in Kazakhstan are intermediate in appearance between cachinnans and barabensis, as already asserted by Johansen as long ago as 1960 ('Die Vogelfauna Westsibiriens'. 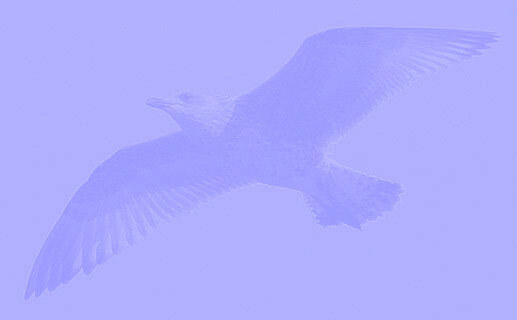 III, Laridae, Alcidae. J Ornithol 101: 316-339). Interestingly (and somewhat ambiguously), elsewhere in their paper Panov and Monzikov refer to the gulls breeding at Lake Tengiz (which was the location used by Liebers and Helbig for barabensis) as cachinnans and state that this is 'about 1000 km south of the breeding range of barabensis'. - and the red spot tends to extend from the gonys onto the upper mandible. At Saltaim Lake, 360 km northwest of Chany Lakes, 18 of 29 barabensis examined in the hand by Filchagov displayed such a black band (Filchagov 1993, 'The Armenian Gull in Armenia', Brit Birds 86: 550-560). At Chany Lakes, Panov and Monzikov found that only two of 12 gulls examined possessed black marks near the bill tip, so this feature may be less well-developed further south and closer towards the breeding range of cachinnans. It has also been suggested that the black band may be a feature of younger adults, which becomes less evident in older individuals (Philippe Dubois, quoted by Panov & Monzikov). The gulls in northern Kazakhstan are deemed to have some cachinnans-type features but a wing-tip pattern approaching barabensis (Panov and Monzikov). On some individuals, however, the extent of black in the primaries and the prominence of pale veins on the inner webs of p8 and p7 (extending well down towards the tips of the feathers) also recalls cachinnans. Some birds show a head and bill profile more attenuated than on classic barabensis. Iris colour in the Kazakhstan gulls is variable, some with an obviously pale eye. A relatively dark iris is associated with classic barabensis but variable iris colour was reported by Panov & Monzikov during their study of barabensis at the Chany Lakes in southwest Siberia. The leg colour of Kazakh birds reportedly includes birds with a greyish tinge and some even with a fleshy tinge (see Olsen and Larson, Gulls of Europe, Asia and North America). years (7 birds were recovered in close vicinity of the	natal colony). Autumn migration appears to take place in	a SW direction. Recoveries from the Caspian Sea region were from August, September and April. No winter recoveries	are available. There were 3 recoveries from the southern part of the	study area (1 juvenile, 1 sub-adult and 1 adult in	September-October) of birds ringed as chicks in a colony	in east Kazakhstan. Yellow-legged Gulls ringed as chicks in the Novosibirsk	region migrate in a predominantly SW direction. The	main wintering area might be situated in the Caspian	Sea region but the number of recoveries are few. None	were recovered in Europe or Africa. The oldest bird	recovered was 6 years. The taxonomic status of the Yellow-legged Gulls ringed	as chick at Lake Chany is uncertain. According to del	Hoyo et al. 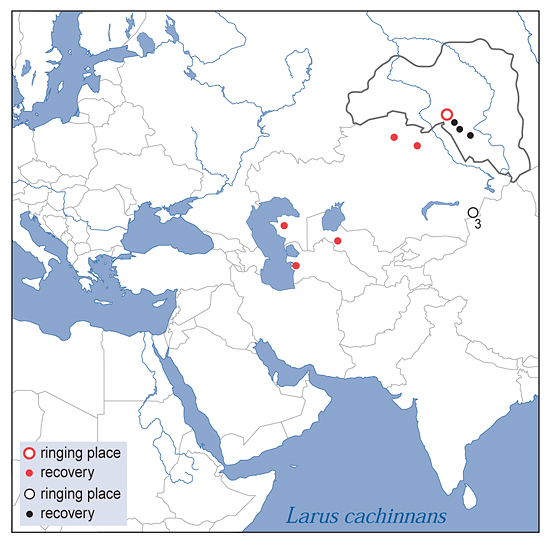 (1996) L. c. cachinnans breeds in the Black	and Caspian Sea area and east Kazakhstan, whereas L. c. barabensis is a breeding bird of the Central Asian	steppes. L. c. mongolicus is mentioned as a breeding	bird from the Southeast Altai mountains and eastwards. cachinnans breeding at lake Chany unknown. Figure 43. 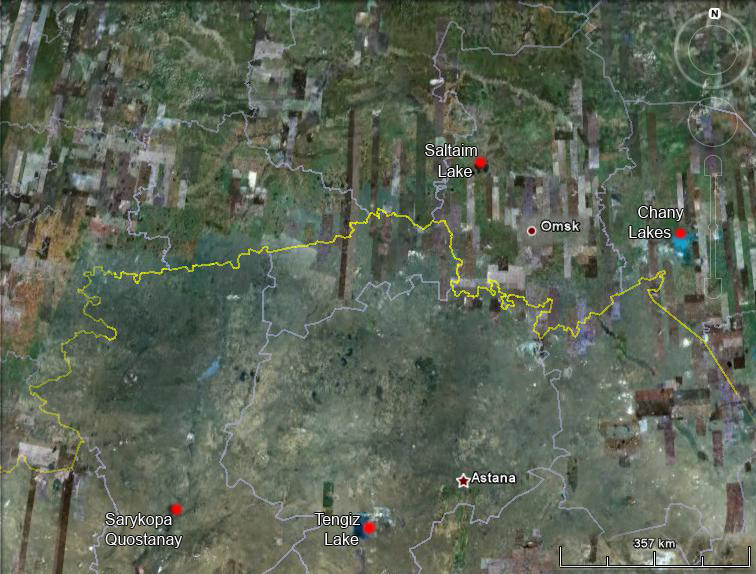 Recoveries of Yellow-legged Gulls ringed as	chicks inside (Lake Chany, Novosibirsk Region) and outside	the study area. Steppe Gull barabensis adult, July 14 2012, near Karasuk, Novosibirsk, Russia. Picture: Sergey Pisarevskiy. Steppe Gull barabensis adult, July 09 2011, near Karasuk, Novosibirsk, Russia. Picture: Sergey Pisarevskiy. Steppe Gull barabensis adult, July 08 2011, near Karasuk, Novosibirsk, Russia. Picture: Sergey Pisarevskiy. Steppe Gull barabensis adult, July 13 2012, near Karasuk, Novosibirsk, Russia. Picture: Sergey Pisarevskiy. transition barabensis adult July 18 2010, Qostanay, Kazakhstan. Picture: Ross Ahmed. Bird from N Kazakhstan. eastern cachinnans adult July 19 2010, Aqtobe, Kazakhstan. Picture: Ross Ahmed. Bird from NW Kazakhstan. eastern cachinnans adult July 20 2010, Aqtobe, Kazakhstan. Picture: Ross Ahmed. Bird from NW Kazakhstan. eastern cachinnans adult July 21 2010, Aqtobe, Kazakhstan. Picture: Ross Ahmed. Bird from NW Kazakhstan. eastern cachinnans adult July 23 2010, Aqtobe, Kazakhstan. Picture: Ross Ahmed. Bird from NW Kazakhstan.